This is the last finish of 2015. It’s my pink and black 4-Patch Stacked Posies. The top has been hanging in my stash of tops since 2007 waiting for the right time to be quilted. The time has come and I found both the batting and backing in my stash. The length of green matches perfectly the green in the focus fabric – although it’s tough to tell in this lighting. It shows up better in the pillowcase. I used the pantograph A Little Bit Of Fluff. The top thread is a Cotton/Poly T40 Variegated thread in Primary Explosion. I used Omni in a Green Turquoise in the bobbin. The batting is Soft & Black — a discontinued batting by Warm and Natural. 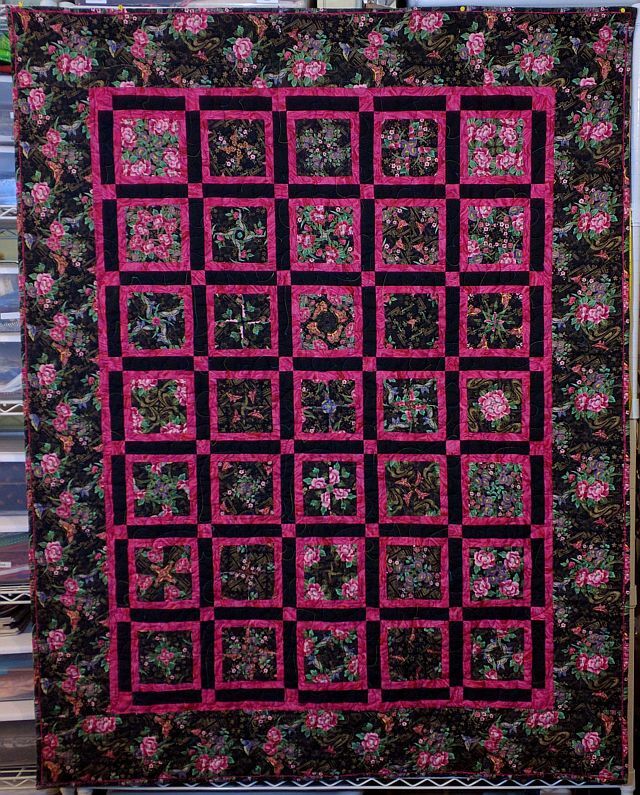 Even though the batting is polyester, the quilt still shrunk a bit — it was 52″ x 68 prior to washing and now it measures 50″ x 64″. 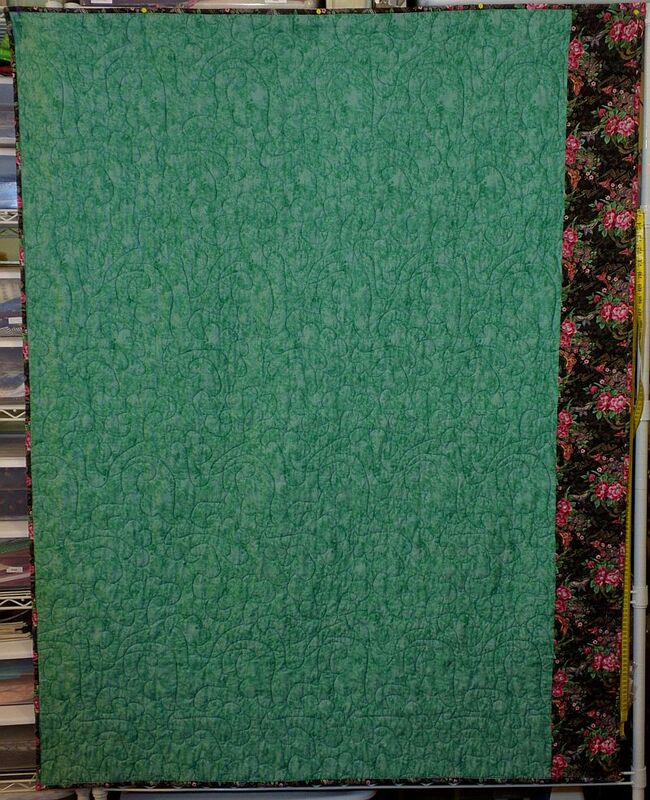 This quilt was on my 4th quarter list for the Finish Along simply because I listed all of my UFOs. 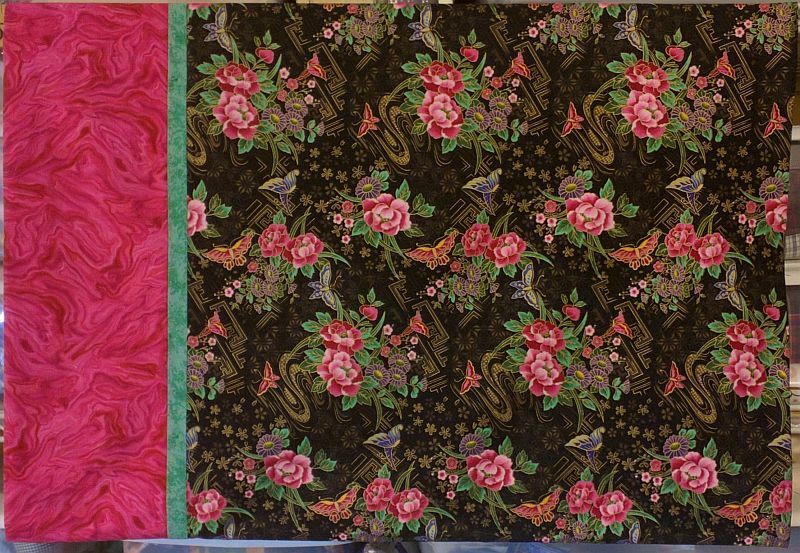 It brings my total finishes for the year to 18 quilts and 30 pillowcases and my UFO count is down to 52 – 22 tops to be quilted and 30 projects in pieces. Now off to stitch the label onto the quilt — I got so excited that the quilt was finished, I missed the last step! At least the label is already made. You sure finished a lot of quilts this year. This one is lovely and good for you to get it done too! I’m visiting as a member of the official 2015 Finish-Along cheerleading squad.